Completed in 1779, it is 11.75 miles long with a rise of around 110 feet and has 14 locks. It was a commercial success from the start, mainly transporting coal. The Erewash Canal obtained its act of parliament in 1777. A year earlier, an act was passed authorising the construction of a navigation from the junction of the Rivers Soar and Trent to Loughborough. This prompted a group of landowners and businessmen from Derbyshire to explore the possibilities of a canal linking the Derbyshire coalfields to the River Trent. This proposed canal would then link Derbyshire and Nottinghamshire to other Midlands counties and on to London. John Smith (formerly apprenticed to William Wyatt) surveyed the area from the River Trent to Langley Mill. This was to be the Erewash Canal and its junction with the Trent is now Trent Lock. John Varley (later sacked for miscalculating water levels) was appointed as engineer with John and James Pinkerton as the main contractors. The canal was completed in 1779. It is 11.75 miles long with a rise of around 110 feet and has 14 locks. It was a commercial success from the start, mainly transporting coal. 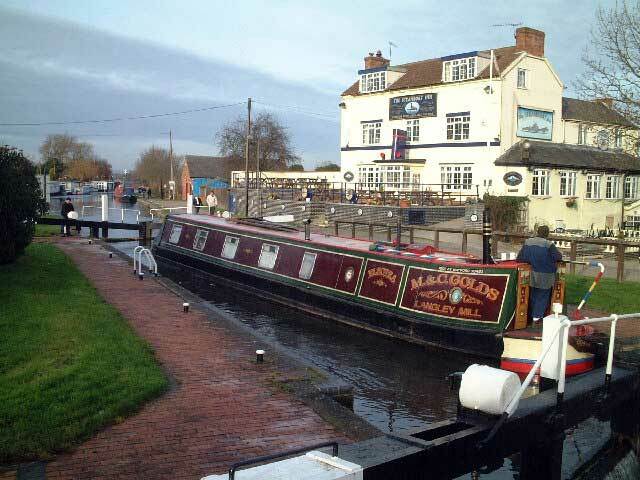 From Langley Mill (where it has a junction with the Cromford and Nottingham canals) to Long Eaton it runs roughly parallel to the river Erewash. It also passes through or nearby, Eastwood, Ilkeston, Awsworth, Cossall, Trowell, Stapleford and Sandiacre. The Erewash continued successfully transporting coal, quarry stone, bricks and metal goods until the railways began to take over around the mid 19th century. Through traffic via the Cromford and Nottingham canals had collapsed and the only significant operations remaining was in goods from Stanton iron works and coal. In 1932 the canal was bought by the Grand Union, it was still a going concern and had a short revival transporting coal. During World War II it was used to carry bombshells from Stanton Ironworks and it was due to the iron works that the canal remained viable for so long. Nationalisation came in 1947, by then the loss of trade due to competition from other forms of transport was taking its toll. The last commercial narrow boat operation was in 1952. The Victorian Pump House – built in 1894, buildings and pumps restored. The Nottingham Canal Toll House – built in 1795 to collect tolls, used in 2008 as control centre for ECP&DA 40th anniversary rally. The Cromford Canal Extension – on-going work beyond the boundary of Langley Mill Boat Co. The Nottingham Canal Swing Bridge – built 1790s now carries traffic over entrance to G.N. Basin. In October 2008 the ECP&DA received an award from British Waterways for ongoing promotion and restoration work on the Erewash canal.